WHEN I FIRST PEERED DOWN into the Black Canyon of the Gunnison, the 2,000-foot gorge looked like a landscape of my darkest fears. Shadows clung to the black and white rock, and the pale light that glimmered on the river seemed infinitely far away. In the spring of 1972, however, Wayne Goss and I were determined to forge a route up the center of the Nose of the Chasm View Wall directly to the rail at the top. The route would be iconic, I thought, like the Nose on El Cap. Wayne had a more realistic idea of what might happen: if we did the climb—fine; if we didn't—that was fine too; the Nose would still be there. We packed our army surplus haul bag with two hammocks, two 150-foot-long ropes, many pitons, and the "new" nuts. Stoppers had only been around for a few years in the US, and we were embracing them to minimize the damage that pitons caused. We'd also found that nuts were sometimes more effective than pitons on sketchy rock. Our provisions were old school: sausage, cheese, hard-rolls, chocolate. We left out the transistor radio, but we packed a bolt kit—reluctantly. On the approach, we passed under the only route on the main wall: the South Face, now known as The Cruise. 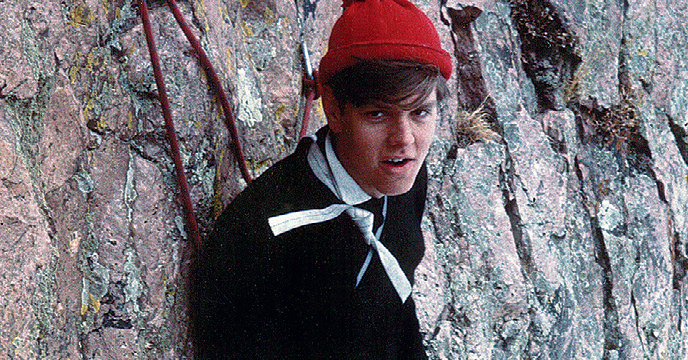 First climbed by Layton Kor and Larry Dalke in 1964, it hadn't yet had a second ascent. At the base of the wall, we filled our water bottles in the river, and then we started up a series of cracks and chimneys full of poison ivy and prickle bushes. The canyon seemed empty, pristine even. We were wide-eyed. And we were alone, working our way up one of the biggest faces in Colorado. Wayne and I took turns leading; the second followed on jumars while the leader hauled the bag. 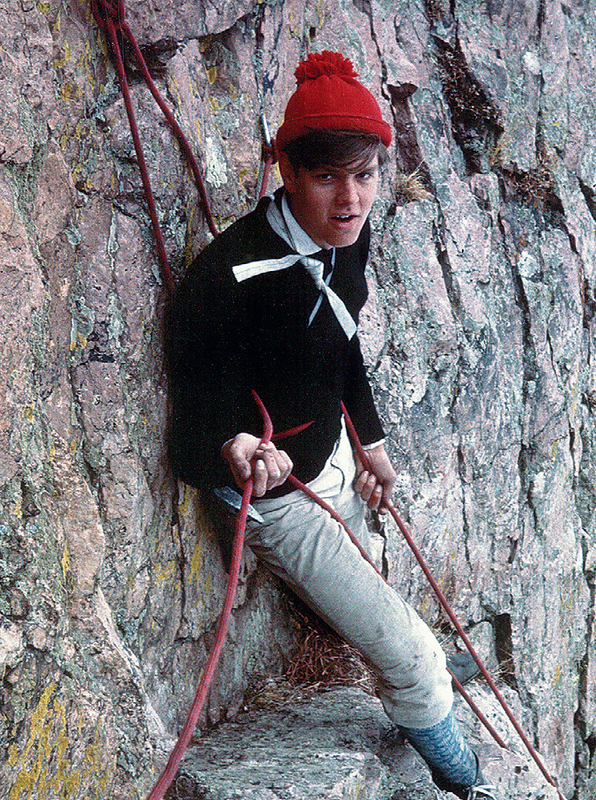 I knew that if I couldn't climb a pitch, well, Wayne would do it; and vice-versa. In one-pitch increments, we watched the river shrink and the rim grow close. Michael Covington and Jimmie Dunn had attempted the same route in 1968 or '69, and after a bivy, we passed their high point and aided up a corner on the prow. That afternoon, we were surprised to see a small airplane drop into the gulf beside us. It flew toward the Painted Wall, where it turned around—still in the canyon—and made several flybys. Jim Sharp and Michael Covington, were shooting a film of us for a Denver TV station. Michael tried to point his camera out the window as they zoomed by. In the end, he only got footage of the cast on his broken leg. Later that day, Wayne led up a crack so thin that only knifeblade pitons fit. Just below a large, loose flake of stone, he put in a bolt to belay. The hollow space behind the flake was almost big enough to crawl inside. I aided and free climbed carefully around it, and then I started up an overhanging corner toward increasingly crumbling, shattered rock. Above me, the corner ended in a blank face. Isolated clusters of thin, fragile flakes blocked access to a leftward-arcing crack that may or may not have lead to the top. But I saw no way to stay on the arete without placing three or four bolts. That would have been an unthinkable capitulation—bolting was cheating. It was late in the day, I was discouraged, and we needed a place to sleep. I lowered off a small nut and cleaned the upper part of the pitch as I descended toward a potential bivy spot. Swinging to the side, I reached our wonderful ledge. Wayne jumared up, ecstatic about this two-person wide, flat, grassy perch. The arc of the wall overhead protected us from rockfall, and the weather was warm and clear. We stretched out, enjoyed a clear, windless night, and shared the view without needing to talk about it. THE NEXT MORNING, I felt discouraged that we'd had to give up our desired line. We decided to follow the series of broken ledges directly above us. There was no sign that any of it had been climbed before. On one lead, I traversed to a pegmatite band. Each time I started up into it, I got scared. I was climbing far past any protection and using clunky shoes called Robbins boots on tiny crystals. Reluctantly, I drilled a 1/4-inch bolt. We topped out that afternoon, happy to have done a new route, though I was still a little disappointed that we'd been unable to finish up the true Nose. At the time, I didn't know that we'd wandered onto Kor and Dalke's classic climb, and that I'd inadvertently placed a bolt on their route. There are now three bolts on that pegmatite band—a testament to how bold the first ascent party had been. Our dream of a true climb up the very center of the wall ended in 1996 when Jeff Achey confirmed that the upper pitches of rock were rotten and unclimbable. Exploring from the top, he and Steve Levin found a traverse to the left of our high point to complete their Free Nose. They named Wayne's knifeblade corner "Jamie and Wayne's excellent adventure," which it truly was. The pitch, with a few added bolts, now goes at 5.12a. I don't know if our original climb has ever been repeated in its entirety. I've given up feeling bad about adding a bolt at the base of the pegmatite band, and I've been thinking that I'd like to climb it again next spring. 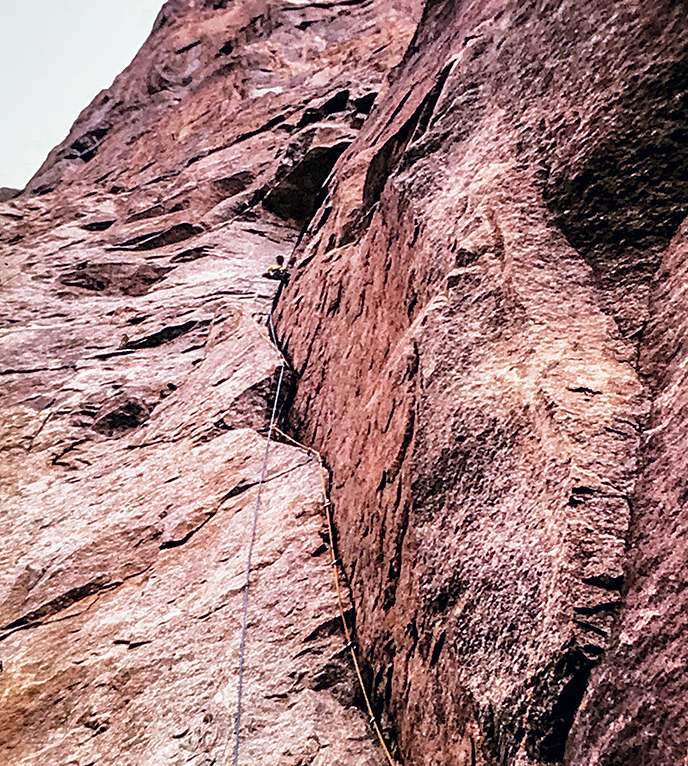 In the past forty-seven years, climbing has changed a lot. To have another excellent adventure—with modern shoes, cams and a superlight rack—would be a cool trip through a rockscape of old memories. All I need is a really good young climber to lead the hard pitches. These days, such people aren't hard to find.